We are happy to be joining in the special This ‘N That Thursday for Thanksgiving, hosted by 2 Brown Dawgs Blog and Ruckus the Eskie. There is something we are especially thankful for this Thanksgiving (other than the new family addition coming)! Kobi is celebrating Senior Pet Awareness Month in his own way….he is rejuvenated lately. Recently he had really slowed down a lot….he was sleeping far more, and he wouldn’t even get up in the morning for breakfast with the other dogs. At night he slept on his dog bed in the bedroom, when he used to mostly sleep with us. He was sleeping a lot more during the day as well. There was nothing specifically wrong going on with him, nothing we could pinpoint enough to feel the need to bring him to the vet. He would get up when he felt like it, and he would eat his breakfast, but not until later in the morning. We added things to it to try and entice him but mostly it didn’t help. We just assumed he was showing his age (13). But over the last couple of weeks, all that has changed. He’s sleeping on our bed again most of the time, and he is up first thing in the morning with his siblings to eat. He barks when his food is being dished out, which he also hadn’t been doing recently. He follows me around the house again when I am home, instead of sleeping all the time. He comes outside and just hangs out with me when I’m playing fetch with Sheba and Cricket. He’s totally back to being his old self. We’re not really sure what to attribute this to. We started adding a small amount of canned food to his dry kibble. His eyes aren’t running anymore, so his seasonal allergies seem to have cleared up. The cooler weather has him spunkier on walks and we walk for longer than we did all summer. We had started adding some salmon oil to all of the dogs’ food recently also. Left is from back in August, right from this week. You can see how much clearer his eyes are. It can reduce inflammation due to conditions such as arthritis, allergies, and inflammatory bowel disease. It can regulate the immune system, either boosting those that are suppressed or calming overactive immune systems for dogs with allergies or autoimmune diseases. It can aid in mental development of fetuses and puppies, and improve cognitive function in older dogs. It can lower blood pressure and triglycerides. 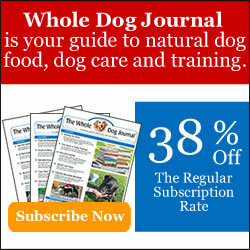 *Information from The Whole Dog Journal. Click here for complete article. Did Kobi have something going on that was causing him not to feel well? I don’t know, but we’re going to continue all of these things we’ve been doing as long as it’s working. We’re just grateful to have him feeling so good, and we hope it lasts for a long time. This Thanksgiving we are thankful for so many things, but especially the fact that we have a house full of senior pets that right now are pretty healthy. I honestly think that part of the reason my hubby wanted to bring a new addition to our crew was that we were feeling Kobi’s days might be getting numbered. But he has bounced back and that makes us hopeful that he is going to be with us for a long time to come! The sleep of a content dog. He’ll even put up with more picture taking lately, and he doesn’t squint his eyes every time! Happy Thanksgiving to all, and here’s a little collage of our pets and some of the things they are most thankful for. Thank you! We will enjoy the good health and hope it lasts as long as possible. We had a great Thanksgiving, thank you, and yours sounds very nice being at the cabin….good for you! Happy Turkey day to you also and so glad Kobi is doing better. Those seniors like to scare us huh? May you have many more good days ahead! Thank you! It certainly isn’t easy having the seniors….they definitely keep us on our toes trying to figure things out. We are so glad we switched foods recently, no matter what we know what they are eating is much better for all of them. We switched our cats food also, and at least one of them seems to be healthier lately too! Hope Kobi had a great Thanksgiving. Happy Thanksgiving to all of y’all! We all had a great Thanksgiving, thank you, and hope you did too! Happy Thanksgiving! Glad Kobi is feeling better. Thank you! Hope you had a very nice holiday! Glad Kobi is feeling better! Maybe I should check out the salmon oil for Scout. Hope you have a Happy Thanksgiving! Thank you, hope your Thanksgiving was happy too! You should think about the salmon oil. It can be expensive, so we just bought a small bottle to start, and once we thought we were getting results, we were able to find a larger one online for a much better price. Kobi, you are such a sweet and adorable pup. We are very glad you are feeling better and moving around more too. =) Happy Thanksgiving. Thank you so much! We hope you all had a wonderful Thanksgiving also! Kobi is looking better. I’m looking forward to seeing pictures of the puppy. Thank you, Clowie! Hope you had a very Happy Thanksgiving too! Wow that is a big change to his tear stains! Is it really just the salmon oil? My whole diet is salmon! Thanks for hopping on to the Thanksgiving edition of This ‘N That Thursday! Hope you have lots of goods this holiday! That must explain why you have such a beautiful white coat, Ruckus! Hope you had a great holiday too! All our boys get salmon oil tablets every day. We also started giving them for help with dry skin (Wilhelm’s, to be exact) plus Jason and I take them too! I knew that they did a lot of that good stuff for humans but I’m glad the tablets help the dogs so much more than I thought too! I am especially glad the salmon oil (might) have helped Kobi. It is so hard to tell what is happening when they get older… It was like this with Tynan and Gryphon. With both of them I found out there was more going on than just aging and I felt bad that I didn’t do more. But it is all about learning! A very, very Happy Thanksgiving from our crew to yours. We are so thankful to know you. Thank you, Bethany, we are so thankful to know you and your crew also. My hubby and I used to take fish oil also, but we weren’t really sure if it was doing anything, so we stopped (you never know what to believe when doing research!). With the pets, it is difficult to know what is just aging, and what could be something else. Then you have to find the balance between letting things go or running to the vet all the time (Kobi has been to the vet for several things that turned out to be nothing). We all just do the best we can, and as you said, learn as we go along. Good for you having senior pets! You dont hear of that stuff to often! I wish you a Happy Thansgiving and have a great day! Thank you! We are so thrilled to have senior dogs, after having lost both of our dogs previous to this crew at very young ages (5 and 6). Aww glad to see him improve. Good luck and happy Thanksgiving everyone! Thank you, Jim! We hope you had a very nice Thanksgiving also! Totally awesome things to be thankful for! I suspect Kobi’s allergies were really bothering him and making him feel icky. Besides the salmon oil, you may want to try a teaspoon of coconut oil. It has great antibacterial qualities and is also good for helping keep the mind sharp. Thank you, Jodi! I hope you had a nice holiday. I think you could be right about the allergies. I tried coconut oil, but the beagles don’t care for it. I use it for some things still though, and can give it to Sheba by the spoonful. Happy Thanksgiving! Katie has her times where she doesn’t feel top, so Mom lets her “opt out” of walks, but after a few days, she perks up again. She had her senior physical and was all healthy, so I think it is just an age thing. She is also much perkier with the colder weather. I think there will probably be a lot of ups and downs as they get older. Hopefully there will be more ups than downs for both Kobi and Katie! Glad Kobi is feeling better. Roxy is 9 and feels her age some days too. I give these guys coconut oil for their coats and lots of other health stuff. I think dogs need the extra oil when they are getting old. Thank you. I use coconut oil for some things also. The beagles don’t care for it in their food though. Sheba will lick it right off a spoon but she’s the only one. So I sneak it into treats when I make them, and use it topically also. Happy Thanksgiving! So glad to hear that Kobi is feeling better. You are right, I bet it’s a combination of all those things that are perking him up, so keep it up and enjoy each day with him. Thank you! That’s exactly what we plan to do. Hope you had a nice holiday also!